This book created quite a stir in the west and in all circles that had held the opinion that no porcelain of any merit had been made since the mid 10th century. This exhibition proved that there were lot to be found also from later periods and in excellent taste and workmanship. There are several books published now from this period, but this one still stands out as one of the most important. The catalog illustrates and details 186 items of porcelain plaques, wares and sculptures decorated in famille rose enamels, wucai enamels, monochromes and under glaze blue. The rich contents include imperial wares for the last Qing Emperor Xuantong and also the short-lived Hongxian regime, painted porcelain by accomplished ceramic artists including the celebrated group of the “Eight Friends of Zhushan”, sculptures and painted plaques of the Cultural Revolution period (1960s and 70s), a variety of antique-type wares and porcelain painted with new techniques. The majority of the pieces are selected from the collection of the Jingdezhen Ceramic Museum – this is augmented by items from private and public collections in Hong Kong. Most pieces are here published for the first time. 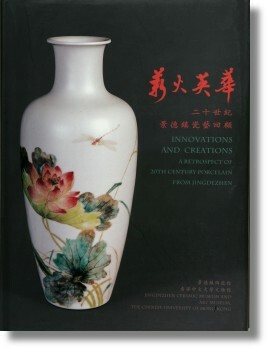 The catalog contains full color plates of all items with detailed descriptions and an introductory essay by Cao Ganyuan, Academic Director of the Jingdezhen Ceramic Museum. Dual text in English and Chinese. Hong Kong, 2004. 255 pp. Over 150 colour plates.